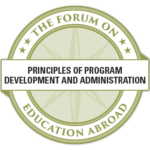 This workshop focuses on Student Learning, Development and the Academic Framework for Education Abroad and will help you to identify the resources and design programming to assist in this effort. Through simulations involving specific examples, participants will address critical issues often introduced by colleagues in higher education who are unfamiliar with the importance of tying these two areas together in education abroad. 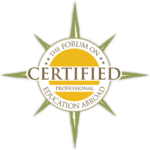 This qualifies as a Forum Certification Workshop part of the Principles of Program Development and Administration Competency Credential. This workshop is associated with the Principles of Program Development and Administration Competency Credential and Module 5 of the Professional Certification in Education Abroad Program. Register for this workshop AND the afternoon workshop, and receive a $50 discount off the total cost! A group discount ($20/person) is offered to four or more paying workshop attendees from the same member institution/organization. Registration for morning workshops includes light breakfast and lunch, and for afternoon workshops includes lunch and afternoon refreshments. Metered street parking is available on the Trinity side of the building in the Atlanta Public Schools parking deck on Washington Street and at various other public lots in the area. There a many hotels located nearby.